Happy Spring! We are officially in the Spring time season and we have been enjoying warm sunny days. Beautiful warm days means that I am spending time in the vegetable garden, checking bees and planting flowers. It also means that I am adding some fresh greenery to our home and this week I am sharing a simple corner of our kitchen decorated for Spring. 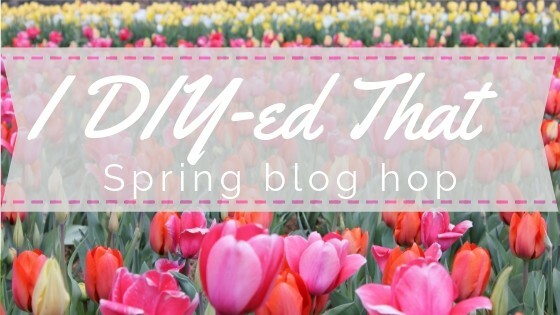 I have teamed up with a wonderful group of bloggers who are all sharing some spring DIYs with you! I’m so thankful for Jen at Noting Grace for organizing this blog hop and inviting me to participate. You can scroll all the way to the bottom of this post to see all of those that are participating. When it comes to decorating, you probably already know that I love to keep it simple and natural. So, when it came time to add a touch of Spring to my kitchen shelves, I knew I wanted to create a simple yet pretty and functional space. I was recently on a flea market trip when I found a small glass cloche, and the same shop had several varieties of tiny plants. I purchased the glass cloche and a small fern. Growing plants under a cloche creates a warm environment for the plant to grow. This allows the plant to a consistent level of humidity. Growing a plant under a cloche requires minimal care since the enclosed environment creates it’s own eco-system. Plants under a cloche will not need the regular watering that a typical houseplant would need. To create your own little garden cloche, simply follow these easy steps. Choose a plant that loves humidity. A good variety of plants includes, Maidenhair Ferns, Creeping Fig, Baby Tears, Mini English Ivy, African Violet and Orchids. Place a handful of clean pebbles or moss in the base of the cloche for drainage purposes. I used an old ironstone saucer as my base. Remove the plant from the pot and gently remove any of the excess soil. Place the plant on top of the moss or the pebbles of the cloche base and lightly water the plant. Place the cloche lid over the plant. Choose a bright spot in your home to place the cloche but avoid direct sunlight. Water only when the plants feels slightly dry. Once your plant gets to big under the cloche, you will have to move it to a bigger cloche. I hope that you have enjoyed this simple, yet pretty Spring idea. Please take a moment to visit Twelve on Main and see her beautiful Spring idea.